The 47th edition of the WRC Vodafone Rally de Portugal can still be a month away, but the sound of the WRC’s has already been heard in Portugal, particularly in the Algarve, where the ACP Motorsport event will take place from the 12th to 14th April. After two WRC rounds in snow (Monte Carlo and Sweden), the Championship gets back to action in Mexico, on gravel and in very different weather conditions to those of the first two rounds. 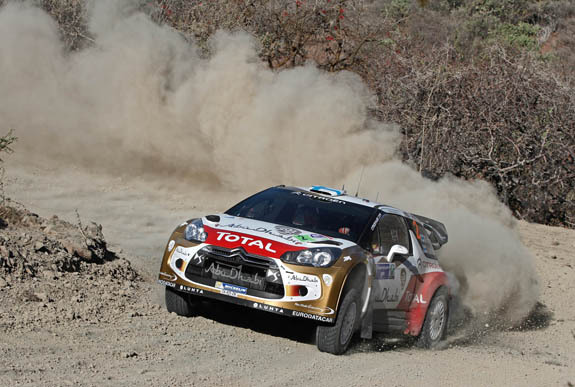 Therefore, and aiming to prepare for the drastic change of scenery, Citroën was in the Algarve for three days to fine tune its DS3 WRC with drivers Mikko Hirvonen, Dani Sordo and Chris Atkinson. Prevented from testing outside Europe, the Gaul team ended up doing a two-in-one since, after Mexico, the fourth round of the World Rally Championship season will be held precisely in the Algarve. The 47th edition of the WRC Vodafone Rally de Portugal can still be a month away, but the sound of the WRC’s has already been heard in Portugal, particularly in the Algarve, where the ACP Motorsport event will take place from the 11th to 14th April.